يضمن فندق Cedar Park Rainforest Resort الذي رمم في 2015 لزائريه قضاء وقت ممتع في كيرنز، سواء جاؤوا في رحلة عمل أو سياحة. يجذب هذا الفندق ذو 4 نجوم، والذي يبعد 50km فقط عن وسط المدينة و 40km عن المطار، الكثير من الزوار سنوياً. بالنسبة لمن يريد الخروج، هذه بعض المعالم السياحية المتوفرة للزوار Butterfly Shop Kuranda, North Queensland Trail Bike Adventure. يقدم Cedar Park Rainforest Resort خدمات لا غبار عليها وكل أشكال اللياقة وحسن الضيافة اللازمة لإسعاد ضيوفه. يقدم الفندق واي فاي مجاني في جميع الغرف, مدفأة, تسجيل وصول/خروج سريع, تخزين الأمتعة, واي فاي في المناطق العامة لضمان الراحة القصوى لضيوفه. لقد جهزت هذه الإقامة الفندقية بعناية فائقة لتوفر مستوى عالي من الراحة. في بعض الغرف يجد النزيل اتصال لاسلكي بالإنترنت, اتصال لاسلكي بشبكة الإنترنت (مجاني), غرف لغير المدخنين, تدفئة, ميني بار. يمكنك الاستمتاع بالأجواء المريحة التي تقدمها كنو, السهام المريشة, مسارات المشي, تدليك, ملعب للأطفال طوال النهار. مهما كانت أسبابك لزيارة كيرنز، فإن Cedar Park Rainforest Resort هو الخيار الأفضل لإقامة مثيرة وممتعة. Although it is in a remote area, its so relax and quiet. Enjoy the bush walk close by. Good self service BBQ facilities. It is a bed and breakfast establishment rather than a hotel. The hotel is located very far into the forest. We encountered difficulty in locating the hotel as there were no GPS signals or cell signals in the area. Uniquely designed interior. Friendly hosts. The hotel is more a bed and breakfast accommodation instead of a hotel. We encountered great difficulties in locating the hotel as it is not accessible by GPS. There was also no mobile phone signals for us to contact the hotel. Guests got to make sure that they arrive at the hotel before sunset otherwise it will be a great adventure to find the hotel which is located about 5 kilometers from the main road amidst forested roads with no street lights and adequate directions. We had two very pleasant days in the Cedar Rainforest Resort. 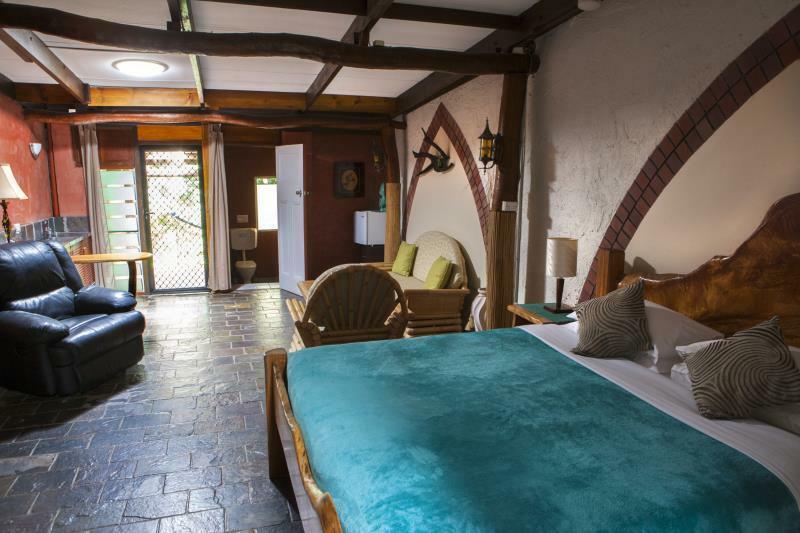 The rooms are spacious, well equipped and maintained. They offer breakfast and dinner on an open deck with rain cover. Unfortunately we were not able to see the platypus,, but we were able to enjoy the wallabies. It was a perfect stay there. Me and my girlfriend went there for 3 night. This was the best experience for me. The resort is fantastic. The rooms were large and well organized (No TV!!). Markus, Rosy & Christoph were prefect hosts. They were very helpful in everything. There is a creek just next to the resort and we also did bush walk using "flying fox". It was a good experience for us. The food was absolutely brilliant. I will go there again. Die Lage des Hotels im Regenwald "in the middle of nowhere" - gute Möglichkeit zum relaxen und Vägel und Wallabies beobachten. Etwas eigenartige Zimmer, ziemlich dunkel. Die Umgebung des Hauses ist ziemlich verwildert, es gibt weit und breit keine andere Möglichkleit zu Abend zu essen, wenn man nicht recht lange im Regenwald im Dunkeln fahren will. Die Lage und das Hotel sind eindeutig ungewöhnlich, durchaus im positiven Sinne. Unser Aufenthalt war traumhaft. In diesem Hotel mitten im Regenwald ist Wildlife-Kontakt garantiert - wenn man möchte - und wir wollten! Einfach unvergesslich schön, so viel aussergewöhnliche Natur und exotische Tiere um sich herum zu erleben! Das Hotel selbst ist wunderschön, klein und individuell gestaltet und eingerichtet. Hier findet man zur Ruhe. Das Personal ist sehr professionell und freundlich; man hat das Gefühl, als wäre man kein fremder Gast, sondern gehöre zur Familie. Wir wurden herzlich empfangen und mit vielen hilfreichen Informationen versorgt, die unseren Urlaub noch schöner und aufregender gestalteten. Vielen Dank dafür!